Welcome to the first 205 Live of the post-WrestleMania. We are deep into the Drake Maverick Era, and as you all know by now, also ankle-deep into the Age of Alexander. Before we get into this week's new developments, let's talk about the WrestleMania match a little first. Looking back at it, I feel the finals of the Cruiserweight Championship tournament might have better served as a 205 Live main event. Like the Styles/Nakamura match, you're just not gonna get an NJPW match—or in this case, a 205 Live match—at WrestleMania with everything going on. 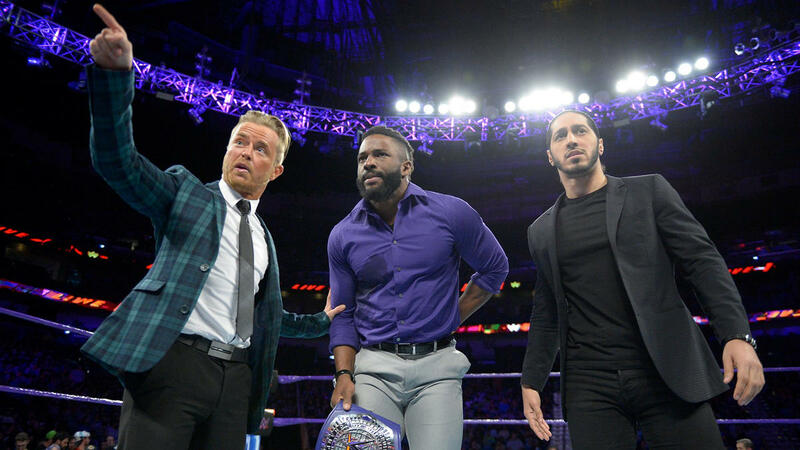 That said, even though I and many other people wanted Mustafa Ali to win, it was obvious that it was gonna be Cedric Alexander at the end of the day. They've been delaying his gratification way before Drake Maverick was even around, and now they're doing the same to Ali. It's all good, but where Ali is taking the opportunity to flesh out his character to prepare for his eventual time, they have to do the same for Cedric as well. Especially now that they've introduced a new player in this story. With a ruthless Buddy Murphy now apparently challenging for the Cruiserweight Championship (that's what the past couple weeks of impressive performances have been leading up to, anyway), Cedric's gonna start having to be more than "this is my destiny." I'm honestly not sure what kind of new wrinkle they can introduce to Cedric's character, but they'll have to think of something. They've got a couple of weeks to rack their brains, because knowing 205 Live, it'll be Mustafa vs. Murphy next week for a shot at the title. Murphy, on the other hand, is great. He'll need to be spotlighted a little more into his heel turn in order to evolve from "guy-who-was-so-determined-to-cut-weight" into what he's supposed to be as a heel, but it's already looking promising. I have a feeling he'll eventually turn into a madder version of Neville. With so many different permutations appearing every week, I'm starting to get uneasy about the Lucha House Party/Team Japan storyline. Thankfully, they managed to keep it from becoming routine by reintroducing Jack Gallagher and The Brian Kendrick into the show's tag team division. Good move to have it come after Gallagher's rehabilitation, and I expect them to go up against Lince Dorado and Gran Metalik next week. Drew Gulak took us on a journey from PowerPoint Presentation fakeout to the mad crusader he is now. What's even better is we're finally getting a Gulak/Nese reckoning, with the match versus Mandrews a great way to segue Nese into the story and reinforce him as a babyface. Excellent performance by Drake Maverick to sell his disapproval of Murphy's tactics. You can be sure that it doesn't transition into a nonsensical title opportunity for Murphy, because he's gonna do something about it. The Smarkometrics Experience Xtreme™ detects changes at the top! Cedric Alexander (#3 last week) — New Cruiserweight Champion, who this? Mustafa Ali (#2 last week) — Takes Cedric to the limit in his first-ever WrestleMania. Not a bad debut at all. Buddy Murphy (#1 last week) — Despite making quite the impact to end this week's episode, he's not the champ. Kalisto (no movement) — Redeems himself with a good win against Akira Tozawa. Drew Gulak (#10 last week) — Launches himself high in the rankings with a decisive victory over Mark Andrews, and a budding feud with former best friend Tony Nese. Tony Nese (#5 last week) — Establishes himself as a babyface to watch after saving Mark Andrews from further destruction via the GuLock. Akira Tozawa (no movement) — Fails to stop Kalisto this week. Mark Andrews (new) — Gives it everything he's got to take Drew Gulak to the limit, but comes up short. Hideo Itami (#6 last week) — No sign of the top striker in this week's episode, other than in a picture-in-picture promo by Tozawa. Lince Dorado and Gran Metalik (tie) — See Hideo Itami.